The process of selecting my ten favourite films ever made was something that, once undertaken, I certainly relished. I knew however, after reading Sight & Sounds’ list and looking at the history of their poll, that this would be a process that required some guidance. I would therefore have to assert a little order into these ‘proceedings’. As someone who has studied film and has seen many great movies; I felt the best way was to spend a few days thinking in terms of directors, and site the films by them that I admire. In doing this I wrote down every film I liked and thought might merit a place on my list; but without getting too critical about it at this stage. Thinking about directors and the works by them I like, helped me do this. After a few days and much deliberation, I settled on a list of around 80 films. This would be my starting point. A close inspection and consideration of these 80 films was made. I thought again of the directors I wanted to be represented on my list; the films that had made the most profound impact on me as a student of film and the ones that I believe are the most important to the cinematic art form itself. With this in mind, I reduced the list to around 30 entries. Further reflection halved this list. Then from 15 films I made the very difficult decision to lose the 5 films I felt on this occasion weren’t quite as important to me. I knew then, when I looked at my list that my process of selection had worked. I was as satisfied with these ten films as I could have been. I decided in order to obtain a list that would represent a variety of my different tastes and thoughts about film, that I would allow only one film per director. I thought of this as a kind of Desert Island Discs, but in a ‘filmic’ sense. I still think this is the best way for one individual to carry out, what is after all an undemocratic process. If one casts their eye over Sight & Sounds’ top ten list, there is no director with more than one film in that list either. I take the point that there is nothing stopping a director from having multiple movies in their best ten films. However, the fact that it has never happened yet, and with it being such a vast voting system, it makes this possibility highly unlikely to occur. Nevertheless, we aren’t Sight & Sound and our voting ‘turn out’ is 1 to their 846; making the comparisons and equal rules on voting structures a little unfair. Rating art is difficult to do successfully, especially judging the sorts that you love. Nonetheless, I still think that from my point of view these ten films absolutely do embody everything I love about cinema. Therefore my self-imposed logical ‘restriction’, of only one film per director, has still produced a list I can stand by fully. Crucial, when I look at the ten now I can honestly say that they are the films I would pick at this moment if I were only allowed ten for my trip to that island – which, with any luck is located somewhere sunny. John Garfield (1913 – 1952), the lead actor in the film and Abraham Polonsky it’s director, were both victims of the brutal House of Un-Americans Activities Committees and their associated Communist ‘witch hunts’. Led by Senator Joseph McCarthy (1908 – 1957), this “Committee” ‘black listed’ these two men - along with many others - and they were unable to work and travel freely. At the height of the Cold War this was a truly shameful period in American history. In many respects, the film itself seems to be a subtle metaphor for much of the criticisms of the Capitalist system at that time. John Garfield (who, unlike Polonsky never recovered from not being allowed to work; dyeing of heart failure aged just 39) plays a crooked lawyer called Joe Morse, whose greed is the catalyst for the film’s tragic events. The film’s strikingly theatrical dialogue, all of which was written by Polonsky, makes it utterly compelling to watch. Garfield and Thomas Gomez (1905 – 1971) - who plays Leo, Joe Morse’s brother, a good man in the film, but one who breaks the law everyday. Because of his brother’s actions and the system that creates them both, Leo eventually pays the ultimate price. These two actors’ scenes together and the delivery of the dialogue have an almost biblical undertone. It is not just the script however. The imagery, historical, political and social importance of the picture, makes it one of the 20th century’s most complete artistic statements in cinema. It is one of those films that I try and watch at least once a year and it gets more impressive each time I experience it. This is one of the greatest American films ever made. In my view it may even be the greatest. Force of Evil makes my list for these reasons and because of the crucial part it played in my own ‘artistic awakening’. Like others mentioned in my ten, this is another tale of ‘Fools Gold’. The film, set in 1560 is the story of a troop of Spanish Conquistadors and their trek through the Andes into the jungle below. It isn’t clear what the purpose of their mission is. Historically it relates to the Spanish conquests of the ‘Americas’ and expeditions which took place during the 16th century. However these fictitious characters and specific events come from the imagination of Herzog the director. This disastrous journey seems to be directed by the Christian God, associated Bible and forces of Spanish colonialism, and takes them into a totally alien and inhospitable environment. The absolute insanity of these acts, appear as a sort of pilgrimage. Everything about this venture is doomed to fail right from the moment we the viewers join this troop of Mercenaries. Klaus Kinski (1926 – 1991) plays the main role of Don Lope de Aguirre and puts in the performance of his life. His strutting mannerisms, animated expressions and the technique he uses to step into the camera’s line of vision, is like nothing I have ever seen in cinema; before or since. His volatile relationship with director Herzog now has a legendary status in film folklore (for more on this see Herzog’s intriguing documentary on the subject called, My Best Friend; 1999). Kinski’s character is a megalomaniac and his awful actions on camera were mirrored with his conduct towards the other actors and crew off it. In fact, the latter was clearly a lot worse as this behaviour took place in reality. However, putting this to one side, the madness that develops in Aguirre and in Kinski’s character is able to transcend the story and the film itself. Being a sited influence on Francis Ford Coppola’s (1939) 1979 film Apocalypse Now; Aguirre has also been read as an indirect comment on The Vietnam War. I would say that this is a far too simplistic comparison. I feel that one of the reasons why this film is so magnificent is its ambiguity; especially relating to such subject matter as this. This reading certainly has plenty of credence. Nevertheless, I believe that this interpretation should, and perhaps now has a broader symbolic significance. The aimlessness and the insanity it creates in the film – on a humanist level – for me acts as a metaphor for much of the West’s foreign interventions and their Imperialist aims. On first inspection it would seem odd that this film should be anywhere near my list of ten films. Firstly, I am not on whole particularly fond of what has now come to be described as ‘Period Pieces’. A category that this film almost certainly falls into. And secondly, I largely find Ryan O’Neil (1941) a fairly boring presence as an actor. He plays Redmond Barry, the lead protagonist in the film. This isn’t really a great starting point, if I think of what appeals to my own tastes. However, I am a great enthusiast of Stanley Kubrick; like almost everyone else who is infatuated by film. In my view this is his greatest picture. ‘Better than 2001? !’, I hear you cry. A film that I have marvelled at also, but for quite different reasons. Allowing for only one film in my ten from a director (which I can assure you takes nothing away from the others on my list), I confidently went for Barry Lyndon because of its beautiful imagery; its emotive, sumptuous cinematic ‘flavour’ and its black humour; and how at times, it verges on the ridiculous. This film is one of those rarities in cinema – not always so rare in Kubrick’s case – when every character is pretty much unlikeable. I think this is actually why the casting has been so brilliantly selected. You believe in the Barry character completely, because O’Neil is totally convincing in this thoroughly loathsome role. It is somewhat of a frustrating dichotomy however, as Barry is an extremely complex character. One is always trying to understand him and make sense of his actions. Oddly you still manage to pity him and his plight. I understand fully why I have chosen this film however. For the way it looks. The cinematography (Director of Photography was John Alcott (1931 – 1986), who won an Oscar for his work on the film), used Zeiss lenses that had been used by NASA, and were adapted to enable the film to have largely only candle and natural light when shooting the night and evening scenes. This atmosphere and the movements of the actors, give the impression of a Reynolds’ or Hogarth painting. This stunning appearance makes the film so unique and perfectly pitched in terms of narrative, character development and the film’s historical period. I had a similar decision to make here as I had with Kubrick. Which film would I pick from Powell and Pressburger’s ‘oeuvre’? It was even harder in this case actually. I felt instead of two or three stand out films, I had to try and decide which film I should select from perhaps 6, maybe 7 strong candidates. I elected for The Life and Death of Colonel Blimp, because of the central performances by Roger Livesey (1906 – 1976) and Anton Walbrook (1896 – 1967) - who are incidentally two of my all time favourite actors, and are at their best in this film. The complete charm and warmth that these two great actors convey in these roles, make the film a classic. Not to forget another great actor Deborah Kerr (1921 – 2007); who is equally brilliant, playing three different roles in the picture. Another basis for my appreciation of the film is the parallels between the two men in the story: Colonel Sir Clive Win Candy (Blimp) an English officer (Livesay) and Theo Kretschmar-Schuldorff (Walbrook) a German one; and the relationship between the two co-creators of the film. The founders of Archers - in my view the single greatest production company and working partnership in the history of British cinema - Powell and Pressburger, an Englishman and an Austrian, worked together on and off for almost 30 years and remained close friends until Pressburger died in 1988. The friendship in the film spans 4 decades and is one which endures being on opposing sides during War, a dual against one another and both men being in love with the same woman - Edith (Kerr). Sounds a little far fetched? Well this is Powell and Pressburger after all, and they tended to air on the side of the whimsical. However, this is its unbridled charm. You are able to put all your faith in these individuals and the story itself. They adapt notions of the ‘Epic Tale’ and use imagery customary of their unique mystical treatment to film making. Through this they manage to express a sense of emotional attachment with all the characters in the film. This film, like all their finest work, is a historical document of true artistic merit. This work is an example of why film should still aspire to create stories and worlds that people can get completely absorbed in. In this film, Powell and Pressburger create a story seemingly about war, but war itself never features. Instead what is presented is a wonderful picture that teaches us a little about European history and a lot more about human decency, true friendship and ultimately, love. So I have reached my number one. I must admit this wasn’t as hard a decision as one may have suspected. I consider Andrei Tarkovsky to be not only one of the finest film makers ever, but one of the single greatest artists that ever lived. In my experience, there is no one who surpasses him in terms of his contribution to artistic visual expression; and certainly no one in film. Therefore after a lengthy analysis of this man’s work, I strongly feel that Mirror is his principal cinematic achievement; and as a consequence this is why in opinion it is the greatest film ever made. As a film it manages to combine and explore the following subjects and themes: a poetic visual language, art historical significance and subtle intertextual referencing; psychoanalysis; human relationships and their lineages; and the implications of 20th century European history as a backdrop to the film’s succession of episodes. This is not a film that one follows in any narrative driven sense. It is a work of art, and as such it is something to ‘experience’. 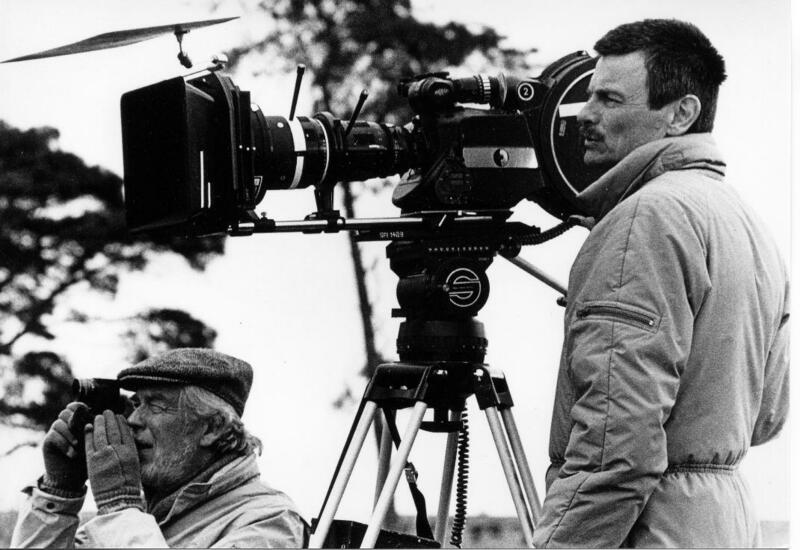 Tarkovsky spent most of his, far too short life as a film maker, striving to create his own cinematic ‘visual poetry’. As a consequence of this single mindedness, his works are a visual expression of human feelings and are emotive experiences that encourage one to question the very nature of human existence and our time worn endeavours. On Mirror itself, the Danish director Lars Von Tier (1956), when being interviewed about his film AntiChrist (2009), recently made this comment, “Have you ever seen a film called the “Mirror”? I was hypnotised! I’ve seen it 20 times. It’s the closest I’ve got to a religion – to me he is God. And if I didn’t dedicate the film to Tarkovsky, then everyone would say I was stealing from him. If you are stealing, then dedicate.” As an artist myself too, and someone who has dedicated their life to art and artistic expression; I interpret this film in a similar fashion to Von Tier. I’m not sure if I would call him a ‘God’, but I would say that in an artistic sense, Tarkovsky is something more akin to a Profit. Ultimately, this film is his own autobiographical account. However this is far from evident, or of any real importance to the viewing experience. Visually, the film’s imagery is produced more like a ‘stream of consciousness’, which has an essential beauty of deeply existential significance. I am not sure what to say about the film’s final scene, other than one day I will attempt an extensive examination of it. To date, this is a moment which has affected me more than any other single moment in film. Using imagery alone, he is able to make a profound comment on real human experience and a life cycle that ultimately we all face. I would agree wholeheartedly with the writer Will Self (1961), and give him the final say on this matter. In June 2012, at a film conference entitled Looking In, Looking Out, Self said that “Mirror remained the most beautiful film ever made”. So there we have it, my own list of the ten greatest films ever made. I’m fairly certain over time this will change. In fact, I’m already sceptical about one or two. However this is a starting point and I feel it represents my tastes, hopes, feelings and crucially, my vision of cinema at its finest. What it is at its best and what it must aspire to be in the future. I would now love to hear some other thoughts on my list and see other considered lists of the ten best films? After all art is a process of sharing and discovery; so please share some of your ideas on this subject. This is only my opinion after all, so a few differing views would be greatly appreciated. To prompt a debate about this question would be even better still. great article and content sharing. Awesome writer and creativity showing here. Loving this kinda of writing for all time.